"American Gods" is a story of family, love, war and mysteries. It is an unique tale of coin tricks, prisons, disappearings and death. But most of all, it is a book about immigration, cultural values, mythology and identity. 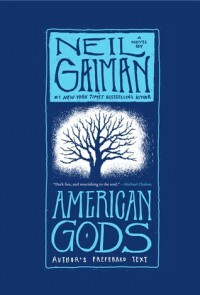 What perhaps seems like absurd nonsense in the beginning, is really Gaiman's portrayal of America as the big cultural melting-pot and meeting point. With a beautiful imagery, Gaiman actually describes what it means to come to America - and to leave one's national heritage behind. And he does it so fluently and elegant, that you will fall in love with his words. This book is an astonishing work of details with well-crafted and carefully executed descriptions, and an odd mixture of reality, mythology and fantasy. The sweet taste of Odin's mead will leave tickling sensations on the tip of your tongue, the world's largest carousel will move around in circles before your very eyes, and the icy cold atmosphere of Lakeside will freeze you to death. The main plot is often interrupted by fragments and pieces of mythology, or seemingly unconnected immigrant stories - vivid portrayals of the culture and the beliefs that America has swallowed up as a whole. As the plot slowly unfolds, you will learn that they in fact are the true heart of Gaiman's story. I adore the creation of the little town called Lakeside. So beautiful, peaceful and idyllic on the surface - and utterly chaotic underneath. Populated with people that lives in confined little bubbles of happiness, and close their eyes to the haunting reality. That part of the book was almost gothic - there is nothing as truly terrifying as numbed human beings, out of touch with their emotions and their sense of right and wrong. Gaiman's book is about gods and ordinary people, murder and mythology - tightly interwoven with stories of tragic human fates, and the tale of a city where ignorance is bliss. Seemingly unconnected dots of unpredictable events, that joins together as a beautiful whole - and not only portray Americans, but also the individuals who have been absorbed and swallowed in the American culture. I have not quite decided how to rate this book yet - I am hesitating, debating whether it is worthy of 3 or 4 stars. It was hard for me to get into, and heavy for me to read. I had absolutely no idea where it would take me - and while it certainly was interesting and surprising, it was frustrating as well. This is such a hard book to read, because it contains so much wisdom and careful consideration. Every single word is important and essential to the story - and sometimes I lost my focus a bit. I will probably change the rating the first thing tomorrow morning - but I will need to sleep on it in order to decide.